India has become one of the preferred outsourcing destinations for software testing services. Although other countries such as China and the Philippines are providing services at a lower cost, India remains the preferred country of choice for most of the US and UK based companies mainly because of its skilled workforce and operational efficiencies. However within Indian market, due to cut-throat competition among the various software testing companies, there is little room for error. Bad software will not only hurt a company financially but will have a major impact on its brand value. Hence an organization needs assistance from an independent software testing company, which is skilled in leveraging the latest testing trends in the market. Mumbai headquartered Ardentia Technologies, better known as Ardent is positioned in the market to help enterprises create brand value by providing numerous web based and Mobile Based Application Testing services. Unlike traditional software testing service providers, the company undertakes a detailed test plan with the test scenarios and test cases which are documented and shared with all the stake holders. This ISTQB Agile certified company has automated the functional testing of the application using Selenium Web drivers. In addition, the load and performance testing is provided using automated tools to check the competency and feasibility of the Applications. In fact all the testing resources are ISTQB certified to ensure that the testing basics are well defined. “The application testing is done by keeping in mind the end users, user experience and ease of use. We prepare a training document and Find out How- training videos, so that it becomes easy for the end users to have hands on experience to navigate through the application,” explains Amit Raina, Chief Operating Officer of Ardentia Technologies. For difficulties faced while accessing the application from different browsers and resolutions, Ardentia team tests the applications in a combination of multiple browsers and resolutions through browser stack to ensure that the applications function properly in the desired and openly used browsers and platforms. “For network related issues we host our solutions with the Data Centers in the world and also monitor our applications regularly to manage the web traffic. At regular intervals optimization process are performed and the SLA is maintained for the time taken to execute the web requests on the applications,” explains Vedhagiri Damodaran, VP Software Solutions of the company. Amit further explains that the remote usability testing is a method of website usability testing when the user is in a different location to the researcher. Vedhagiri opines that an alternative method is to run an un-moderated test where the test participants are provided a set of tasks to complete on screen whilst they progress through the session. “The results are generated for the researcher to review when the test is complete. However, tests with no moderator involved are much harder to control and therefore offer questionable value. With this regard, we will stick to the moderated method,” unveils Vedhagiri. Owing to dependence on moderate method, clients get a realistic user environment compared to the less natural environments often used for traditional user testing. By leveraging expertise in remote testing, Ardentia Technologies has been enabling researchers to test from various geographical regions from a single location apart from helping companies save time and costs over hiring a professional usability lab. “It is easier to recruit participants as they do not have to travel to the research facility. In addition, researches have the opportunity to observe true user behaviour as they catch users while they attempt to complete tasks,” points out Amit. 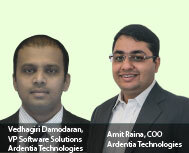 Apart from providing remote testing service, Ardentia offers Unit testing, Incremental integration testing, Integration testing, Functional testing, System testing, Sanity testing, Regression testing, Acceptance testing, Load testing, Stress testing, Recovery testing, Security testing, Compatibility testing, Comparison testing, Alpha testing and Beta Testing service. For providing various testing services, Ardentia follows a process which is beneficial to all of its global and national clients.“It is critical that the organization defines a process that is robust and certified by experts in order to initiate the software assurance quality culture. Our process will serve as a guideline that may evolve over time. Most importantly, it should be made official and should be followed through. Improvements will be made until a mature process is established,” explains Amit. To provide better testing service, Ardentia team takes ensures proper managerial commitment, deliverables, tool usage, metrics, testing environment, test data, change management and developer awareness. With quality as the front runner and the need of the hour by users and constant advancements in software quality testing the changes that one envisions in the field of software testing would have various options to choose for. Vedhagiri believes that as the specifications become more straightforward through an early involvement of the entire team, developers will find it apt to know what their code needs to accomplish. Going ahead his team envisions automating the functional testing and daily testing activities apart from ensuring that the testing resources are Agile certified testers so that the model is properly followed and implemented for all the projects. “We aim to improve testing process more efficiently by continuously automating the web services and API testing,” signs off Amit.